Makeup and beauty !!! : My FOTD for daily wear ! My FOTD for daily wear ! Today i am going to share my fotd that i used to do on daily basis or during any event that usually occur in daytime. MAC STUDIO FINISH FLUID IN NC35. RIMMEL STAY MATTE POWDER IN SHADE AMBER. TWO SHADES ONE SHIMMERY BRONZE AND ANOTHER MATTE BROWN FROM MUA UNDRESS ME TOO PALETTE AND MUA MATTE PALETTE. FACES SOLID BLACK KOHL PENCIL. 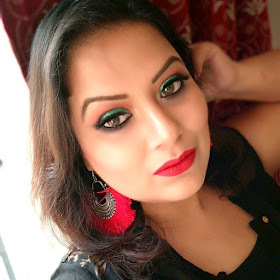 LAKME ABSOLUTE BLUSH DUO IN SHADE CORAL. DAB SOME MAC GLAMOUR ERA LIPSTICK on my lips as tint. Well, that’s it! These are the total products that I used to create this look ! Kaise miss kar do sweethrt. .